Three feet and five inches. Swords have been around since 1600BCE. Pistols, including revolvers, since the early 1500s. Government efforts to restrict their use to the “right people” go back about as far. The “right people” are typically the members of the party in power. The “wrong people” are political opposition, the poor and the ethnic minorities. Modern India illustrates that perfectly: the untouchables caste members are completely disarmed, while the top castes have access to weapons despite them being extremely rare and expensive. The same was true of the USSR, Fascist Italy and Nazi Germany — they were not so much anti-gun as interested in the monopoly on gun ownership. That monopoly is always enforced with — surprise, surprise — with more guns wielded by the loyalists of the government. This entry was posted in civil rights, pistol, weapon and tagged 45ACP, M1911, sword. Bookmark the permalink. 7 Responses to Three feet and five inches. “When the Cambrian measures were forming, They promised perpetual peace. Still as true today as it was back then (as is the rest of the poem). A shield is a great complement to the set up. Romans knew what they were doing. That 1911 pattern looks more like 4″ of barrel? 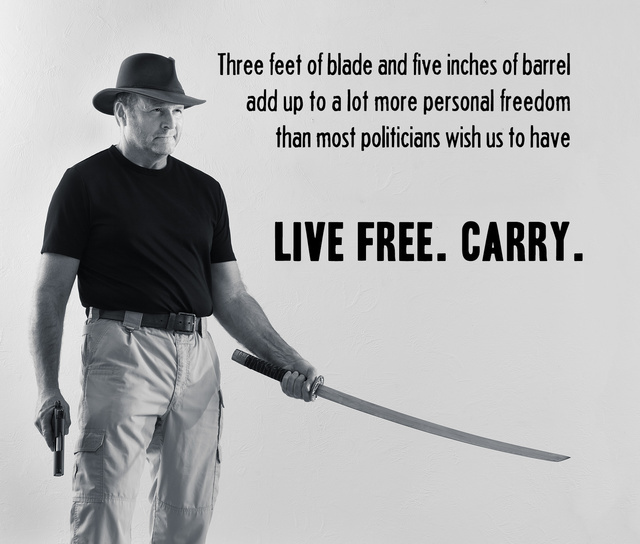 I prefer 3 feet of barrel and 5 inches of blade (my flintlock and hunting knife). But who am I to judge? In Germany, it was the Wiemar Republic that initiated gun licensing, mostly to keep the communist (KPD and RFB) party members from owning them. That was quickly expanded to eliminate anyone who supported those parties even though they weren’t official members. Once the Enabling Act was passed in 1933 owning a firearm was more dependent on your standing in the NSDAP than by law. “Guns wielded by loyalists of the government.” Such, historically, was also the case in the United States. I recently saw an interesting comment that the infamous “Sullivan Law” (the NY anti-gun law from the early 1900s) was created by a machine politician at the request of his gangster supporters, because they wanted a safer “work” environment and disliked being shot at by armed law abiding citizens. Not clear how accurate that it; it would be interesting to research that.